Ownership / Access: Now a Museum, Administered and maintained by the August Abrahamsons foundation. Opening Times: Open to the public, daily between May-September. 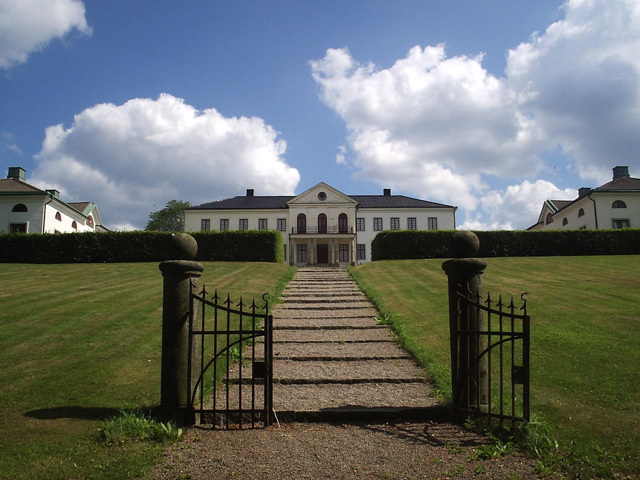 Notes: Naas Castle is a 17th-century mansion near Goteborg, Sweden. It's situated at the lake Savelangen in Vastergotland. In the later half of the 19th century Naas became world-renowned through its Crafts College and for more than 50 years it was regarded as 'Sweden's window to the world'. The mansion Naas Castle is to be found on the Naas estate at Savelangen lake in Vastergotland, Sweden, east of Floda, Lerums municipality, Skallsjo parish. Naas estate is widely renowned for its Crafts education during the late 19th century and the early 20th. The official spelling for geographical map productions is Nas. The main building on the cultural heritage site of Naas estate, Naas Castle, is now a museum open to the public, daily between May-September (only guided tours) as well as for pre-booked group-appointments outside of the tourist season. The estate exists of a number of historic buildings open to the public. In addition to a restaurant, cafe, art & crafts shop and west Sweden's very own heritage foundation, byggnadsvard Naas, a range of exciting public events are organized each year (more information and Naas Castle and Crafts College home page). Art & Crafts courses, though in a far lesser extent, are still practiced in one of the buildings. The old stable is now home to a horse riding school and Naas horse association. Beside several nature and walking trails, Naas estate also provides Bed & Breakfast as well as conference accommodations. During the summer several craft courses are held at the 'Slojdseminariet', the crafts college official building. Naas Castle and Crafts College is administered and maintained by the August Abrahamsons foundation, a Swedish government administration. "Naas Castle & Crafts College". uk.naas.se. Retrieved 9 September 2012.